I was thrilled to get the latest tea chocolate collection in the post from Katie Christoffers of Matcha Chocolat – it made a more than pleasant change from the bills. Like her Emperor Selection and Jade Selection, the Lotus Selection did not disappoint. The familiar pink box with its distinctive teapot logo is almost like an old friend now (and like an old friend, I wouldn’t mind seeing it a bit more often). It’s very welcome and a sign of good things to come. 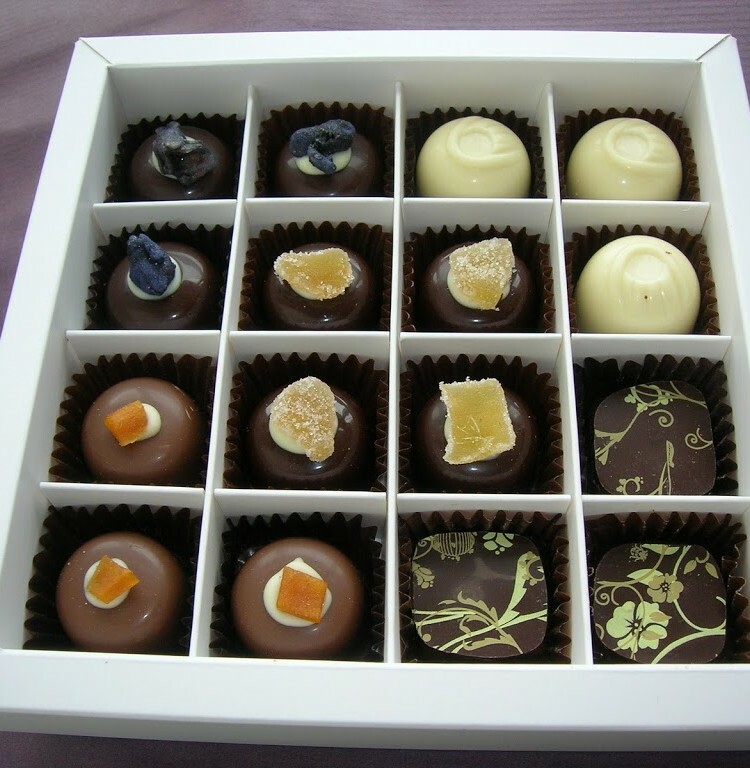 The chocolates come in five flavours and are beautifully presented with a mix of white, milk and plain. There are four newcomers to this collection and they cluster around the venerable Masala Chai as if paying homage to it. It is rare to be able to find freshly made chocolates that have no additives to prolong their shelf life. The freshness of these chocolates really comes through. Secret Garden – A delicate violet scent caresses the nose followed by a fuller flavour when this glossy dark chocolate dome is bitten into. Unexpectedly, a layer of tangy violet jelly lies just beneath the surface, under which the milk chocolate ganache can be found. The taste of tea quickly follows the violet and though not in the least powerful, it is persistent and noticable. I was slightly worried about associations with great aunts and Parma violets, but needn’t have been, as this is nothing like as strong as a traditional violet cream. Keemum Mango – A pertly placed piece of dried mango sits on top of this milk chocolate dome. Inside is a wonderfully light and smooth textured milk chocolate ganache. It has a subtle yet penetrating flavour of mango, something a bit floral and with the flavour of Keemum tea providing a good solid backing. The panel were in 100% agreement that this was absolutely delicious and it would be very easy to eat more of these than would be good for you. Masala Chai – This dark chocolate with its cap of ginger is the signature chocolate in the collection and I was very happy to see this old favourite back; I would have been most disappointed had it not been there. It has a soothing creamy quality, something to do with all that dark chocolate and blend of healing spices – you could almost believe you were on some kind of ayurvedic treatment or health kick. April Snow – CT thought this white chocolate was straight out of the harem with its oriental opulence, silky texture, and powerful floral taste. As a white tea drinker, I thought the ganache blend here was just about right. It both smelt and tasted deliciously of creamy tea, not too strong, but definitely there with a light taste of alcohol coming through later. Genmaicha – The design on top of this plain chocolate square was so beautiful, I felt guilty about biting into it. I heroically overcame this diffidence, however and after inhaling the strong chocolate and tea aromas, I sank my teeth into it. Immediately, I was aware of an earthy slightly bitter taste, almost like a cup of wake-me-up coffee. This was a darker, richer and altogether more chocolatey experience than the others. CT thought it would bring you back down to earth after the ethereal delights of the violet. Although a tea connoisseur would appreciate these chocolates, we mere mortals find them delicious and intriguing. Within this selection, there is bound to be something to suit all tastes. Some of the Belgian chocolates I tasted were pretty damn good, but Katie’s could matcha up to any of them – pun fully intended. MMMMMMM,..those chocolates aka pralines like we call them look amzing & pretty too! You are a lucky lady, could you perhaps drop hints to Matcha Chocolat about the Ordinary Cook? Those genmaicha chocolates look divine! A combination I’d particularly love…hmm.. The chocolate with the floral design is a work of art…I’d still eat it though! Liz – it had much the same effect on me and I had the addition of the memory to contend with. Sophie – that’s praise indeed from the capital of chocolate making. Interesting what you say, we would call these truffles and think of pralines as a chocolate that has a nut pate inside. Ananda – it is very difficult eating something you want to keep looking at, but I managed it. Celia – when will you be getting on to your next batch of chocolate making? Looking forward to it. CC – yes I managed, somehow, to overcome my reservations, and bite into it. Village Pantry – thank you, glad you like it and hope to see you again. oh seeing this just reminds me i NEED to conquer the tempering. Especially before it gets too hot. They look gorgeous. April Snow looks interesting. Thanks for the review.